...safely store all your presentations, spreadsheets, PDFs, images, and any other kind of document in iCloud. Documents you store in iCloud Drive will be kept up to date across all of your devices, and you can access them from your iPhone, iPad, iPod touch, Mac, or PC. This brief article aims to clarify what exactly iCloud Drive is, how you access it, as well as the big problem that it has. iCloud Drive really is, in many ways, just another cloud storage service like Dropbox or OneDrive – you save files to the iCloud Drive and they are accessible on other devices and online. But the other way to think about it is an extension of iCloud's previous feature, Documents in the Cloud. That feature allowed apps to save files to iCloud so that they could be synced with the same app on your other devices, but the problem with that feature was that apps couldn't access files saved by other apps. iCloud Drive is the solution from Apple that will let any app that supports iCloud Drive access and edit files that have been saved by other apps. You can view your entire iCloud Drive from Finder (by default it should be in the favorites sidebar). From there you'll notice that there are a number of folders with app icons (such as TextEdit and Preview); these folders are where those apps will save files by default. On OS X Yosemite you can see and edit all these files without any issues – you can even create your own folder within iCloud Drive or add files from your Mac into the iCloud Drive. Any app, whether it is from the Mac App Store or not, can open files from or save files to iCloud Drive. This is because, for all intents and purposes, iCloud Drive is a folder on OS X Yosemite that just happens to sync with iCloud. The most obvious difference about iCloud Drive on iOS is that because there is no Finder equivalent, there is no in-built app to view all your iCloud Drive files and folders like you can on OS X Yosemite. To resolve this problem, apps on iOS can implement the iCloud Drive Document Picker which will provide a popup window that gives you access to the full iCloud Drive. One such example of an app that implements the iCloud Drive Document Picker is Readdle's PDF Expert. The iCloud Drive Document Picker in PDF Expert. You can also access iCloud Drive from a compatible web browser – Safari 6 or later, Firefox 22 or later, or Google Chrome 28 or later. This web version of iCloud Drive lets you create folders, upload files, download files, and delete files. iCloud Drive is also available on Windows 8 or later and it works in a very similar way to iCloud Drive on OS X Yosemite. To get started, install iCloud for Windows. iCloud Drive is a part of iCloud and unfortunately iCloud gives you a very limited 5 GB of storage space. That storage space is shared by iCloud Drive, Mail (if you use iCloud Mail), Photos and Backups, so as time goes on it is increasingly likely that you will have to upgrade from the free iCloud plan. See this helpful Apple knowledge base article for prices in other countries. You can upgrade on iOS by going to Settings > iCloud > Storage > Change Storage Plan. On OS X Yosemite it is System Preferences > iCloud > Manage (bottom-right) > Change Storage Plan. There's little doubt that iCloud Drive is an improvement over its predecessor, Documents in the Cloud. Implementing the Document Picker system, which allows a user to access files that have been created in other apps, is a much needed improvement. But there are some fundamental flaws with iCloud Drive and they are quite fundamental in my opinion. Apple's decision to avoid using a traditional 'file system' may have made iOS simple to use, but it has also made iOS maddening to use for those who want to take full advantage of the platform. iCloud Drive sits awkwardly as a solution to a problem that Apple created. 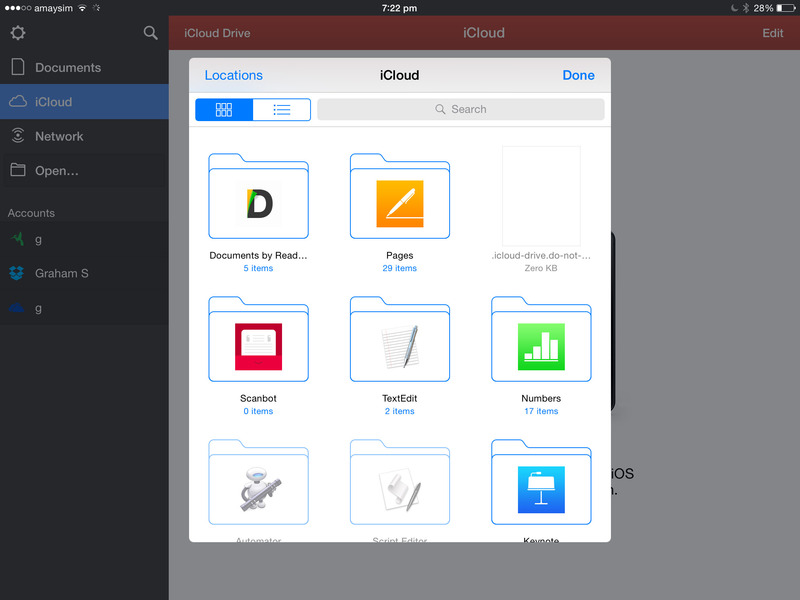 Apple at first tried to avoid implementing a file system on iOS but have now realised that some users need it and have created iCloud Drive in a way that tries to hide what is ostensibly a file system, ultimately making it more complicated. The problem is that files still get stuck in these weird app folders, which frankly makes no sense to me. If I have multiple text editors or spreadsheet apps, how am I supposed to know which app I created the file in? In my opinion, Apple should get rid of these weird app folders and simply save files to the root of iCloud Drive, or into user-created folders if the user chose. To simplify things, apps such as Pages which can only view certain document formats would only need to display those files which it could open. This way, there is no file system unless the user creates one and iOS only displays the documents relevant to the particular app being used. No need to hunt around in the dozens of app folders to find that one file you were looking for. Surely that would be simpler?